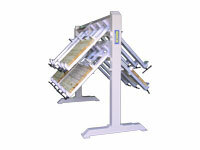 The QUICK Clamp Rack is our most compact and affordable gluing machine. 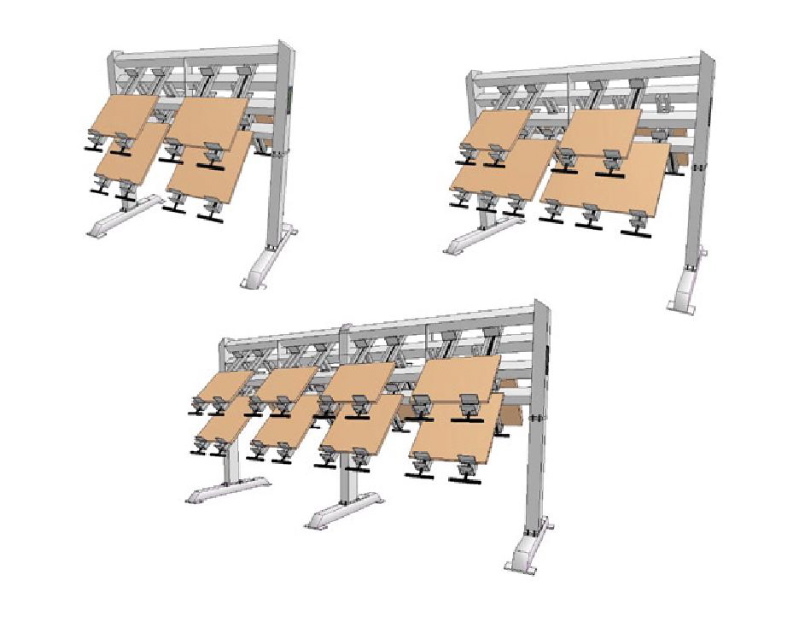 The Clamp Racks moderate cost, ultra high-quality clamps, super-strong frame and efficient use of floor space make it the ideal gluing station for the small to mid-sized cabinet shop, furniture manufacturer or millwork producer. To view high-resolution photographs of an 8' wide QUICK Clamp Rack, please click on the images to the left. The QUICK Clamp Rack features a cleanly-designed, exceptionally strong frame, with massive 4" x 4" structural tubing cross beams and feet, and 4" x 6" structural tubing legs. The innovative two-sided frame design allows for either one-sided or two-sided operation, at the shop owners discretion. The one-sided configuration allows for placement of the frame tightly against a wall, for maximum compactness. 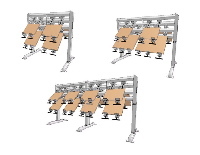 The two-sided configuration doubles the amount of easily-accessible clamping area, for industry-leading room to work. The Rack is configured by choosing either of the two available foot mounting positions. 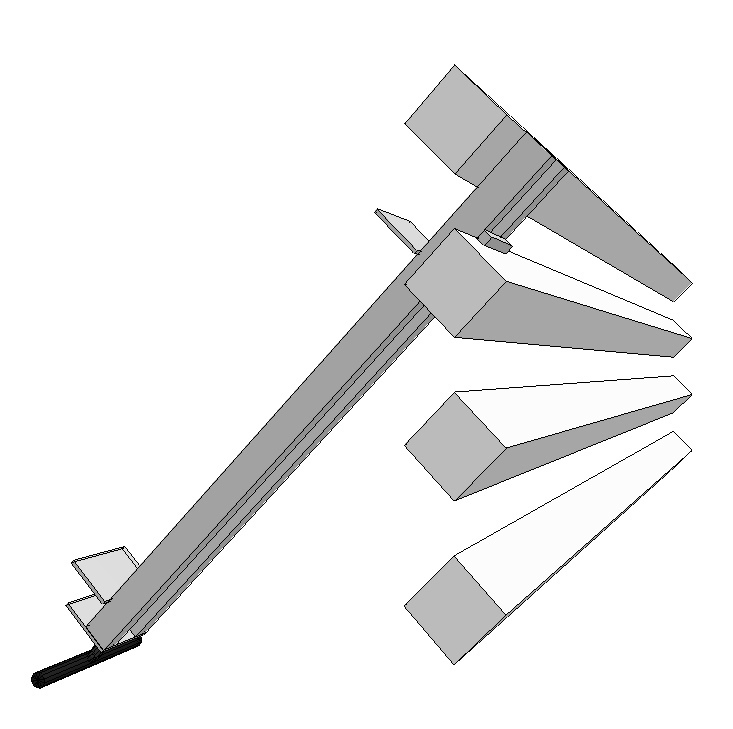 Clamps hang at an ergonomically ideal and floor-space-saving 45-degree angle, and are easily lifted out of the frame and moved from row to row as needed. 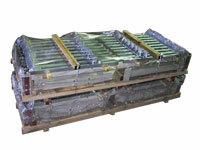 The frame has six rows (three on each side), and clamps can be installed on all six rows. However, for optimum working room, we recommend leaving a one-row space between the working rows. QUICK clamps are, by a considerable margin, the heaviest-duty and highest-quality clamps available to the woodworking industry. Each clamp weighs 30 pounds, and features full box-frame construction, zinc plating to minimize corrosion, 3.5" high jaws, quick-adjusting rear jaws, and long, smooth, easy-on-the-hands handles. 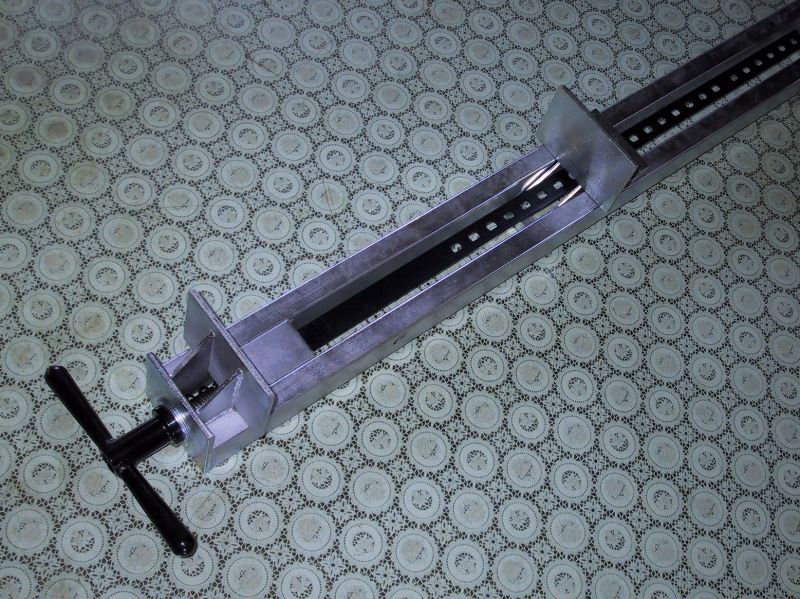 Standard clamps are 32" opening, with 40" opening clamps also popular; other sizes are also available. 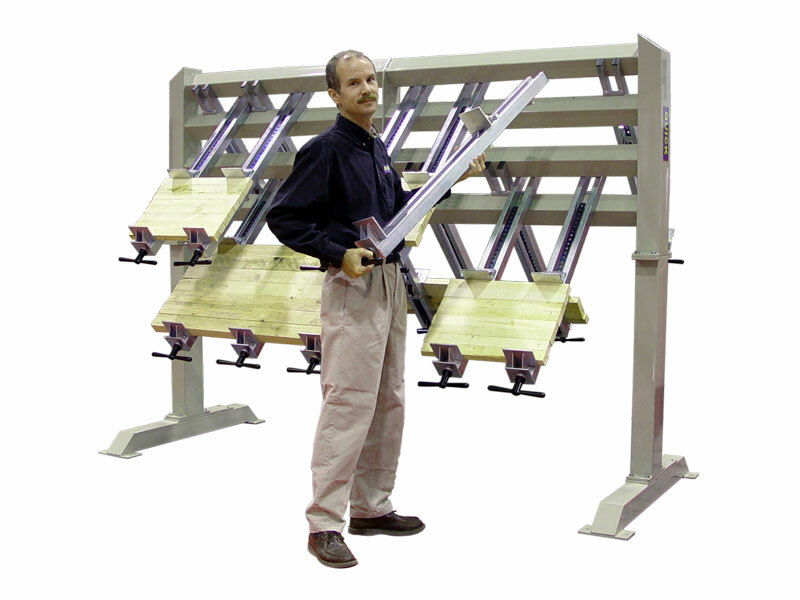 The QUICK 8' wide Clamp Rack with 16 32" opening clamps is our most popular package. We also offer a 12' wide Rack with 24 clamps. Additional clamps are readily available and can be added at any time. For current pricing, please download the Spec Sheet below. For extra-long-length gluing, two or more Racks can be placed side-by-side. 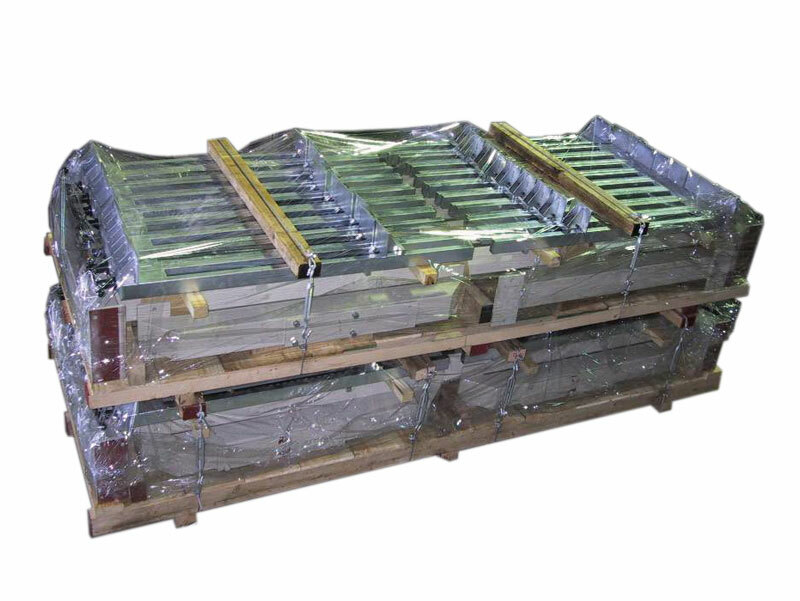 The shipping dimensions and weight for an 8' Clamp Rack with 16 clamps are: 89" long x 45" wide x 22.5" high, 990 lbs. Interested in availability? 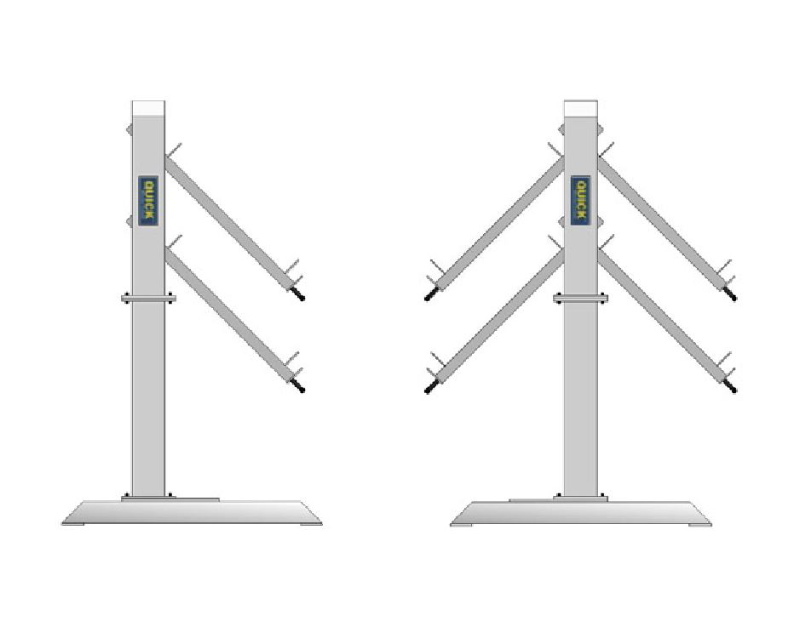 Check and see which Clamp Racks we currently have in stock at our Los Angeles warehouse. We accept Visa, Mastercard, company checks and wire transfers. We usually ship within 24 hours. Give us a call! Questions? 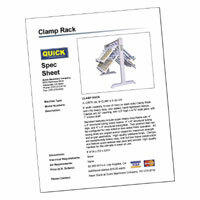 Be sure to visit our Clamp Racks Frequently Asked Questions page. 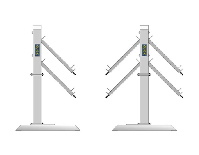 To view a movie of an 8' Clamp Rack, filmed at a recent trade show, please click on the image to the left. 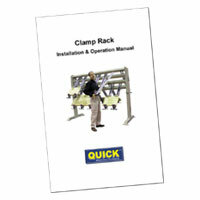 To download a PDF version of a QUICK Clamp Rack Installation/Operation manual, please visit our Manuals page by clicking on the image to the left.